With the U.S. midterms elections just weeks away, Facebook says it is broadening its policies against voter suppression. The updates were designed to address new types of abuse that the social giant is detecting, according to Jessica Leinwand, public policy manager, Facebook. The company already prohibits offers to buy or sell votes, as well as misrepresentations about the dates, locations, times and qualifications for casting a ballot. “We have been removing this type of content since 2016,” Leinwand notes in a new blog post. 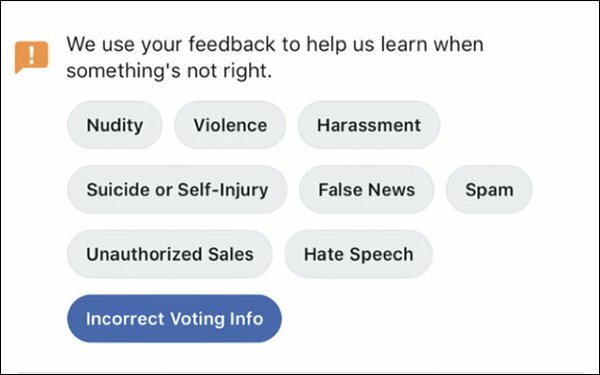 Adding to those measures, Facebook is now banning misrepresentations about how to vote, such as claims that one can vote by text message and statements about whether a vote will be counted. The company recently introduced a new feature on its platform so users can report voting information they believe to be incorrect. Facebook also established dedicated reporting channels for state election authorities so they can do the same. Noting that Facebook’s effort remains a work in progress, Leinwand admitted the company is still unable to verify every claim about the conditions of polling places worldwide. “In these cases, we will send content to our third-party fact-checkers for review,” Leinwand said. Moving forward, content rated false will be ranked lower in News Feed and accompanied by additional information written by Facebook’s fact-checkers -- what it calls, “Related Articles” -- on the same subject. Rather than applaud Facebook for trying to clean up its platform, critics say the company should simply be running a more secure service. “It’s yet another example that Facebook is not prepared to proactively meet the challenges of abuse and misinformation on its platform,” Angelo Carusone, president, Media Matters, a nonprofit media watchdog, said last week.